The 645N is a auto focus medium format SLR film camera released by Pentax on 6 December 1997 in Japan, and introduced in the US in February 1998. It is based on the previous Pentax 645 model which is a manual focus camera. It is the first medium format auto focus SLR system to be available, using the Pentax SAFOX IV phase-matching predictive autofocus system (The Fujifilm GA645 was the first medium format camera with autofocus, released in 1995). 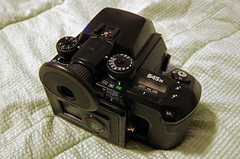 Competing cameras such as Contax 645 AF and Mamiya 645AF arrived more than one year later in 1999. In 2010, a digital version of the camera became available called Pentax 645D, later upgraded to the Pentax 645Z. The Pentax 645N was planned as the successor to the Pentax 645, released in 1984, and inherited the latter's basic design concept. For this reason the name was also not changed, only adding the letter "N", meaning "new" or "new generation". The fundamental design was a medium format camera with 35mm handling, for which the designers used the catch phrase "Super field camera". The development concept taken from the original Pentax 645 included: 1. easily being able to take handheld shots, 2. compact, lightweight and flexible, 3. eye level finder with short viewfinder blackout, 4. automated film winding, allowing continuos shooting without changing the holding of the camera 5. durability and high reliability. This concept was then applied using new technologies, combined with the medium format and 35mm technologies of Asahi Optical. 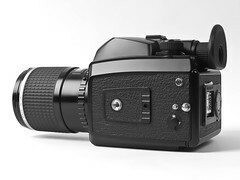 The major new functions according to the developers include: 1. high-performance autofocus, 2. three metering modes, 3. high speed internal winder, 4. automatic bracketing, 5. data imprinting to the film, 6. increased number of shots per film, 7. improved operability and visibility by reviewing the entire operating concept and 8. enhanced information in the finder. In addition to these functions, Pentax tried to address as many requests from Pentax 645 users as possible. Shashin Kōgyō (Photographic Industries), Vol 56, No. 3 (1998) p. 60. Image presumably originally by Pentax. The Pentax 645N body is very similar to the previous model, but uses knobs for many of the functions. The previous model required using multiple buttons for adjusting most settings. 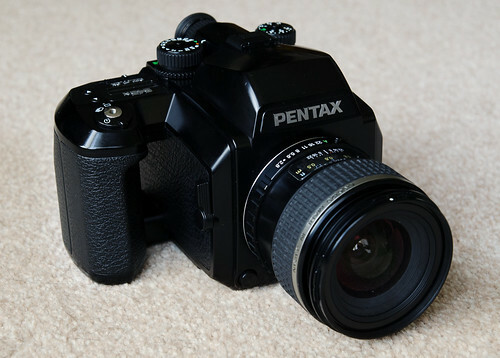 It is compatible with Pentax 645 series of Pentax-FA (auto focus) and Pentax-A (manual focus) lenses. 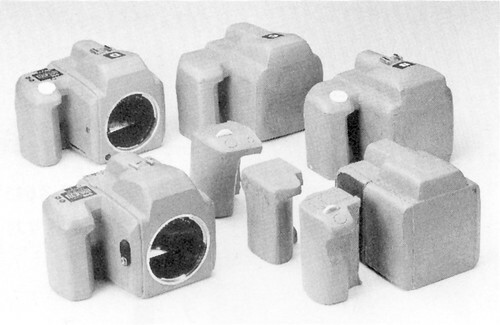 Pentax also manufactured an adapter for using their 6x7 lenses. The film is automatically advanced with a motor drive. The roll film is loaded onto 120 or 220 film holders. The film loading is semi-automatic requiring alignment of a start mark. The holders have a memo slot as a reminder of film emulsion type. The holders cannot be exchanged mid-roll. There are two tripod sockets, one on the base the other on the left hand side. The electronic vertical-travel cloth focal plane shutter has speeds of 4 seconds to 1/1,000 of a second. A bulb mode is provided, but consumes battery power. The electronic flash sync is at 1/60 of a sec. This can be used with the built-in hot shoe or the pc sync socket on the left of the body. The shutter release has a screw in cable release. Surrounding the shutter release is a collar to select between motor drive advance modes, with single and a consecutive mode that can advance at up to 2 fps. A self-timer is also available on the shutter release collar, it has a delay of 12 seconds. Multiple exposure is possible, rotate the knob on the left side of the body before exposure, and return before the last exposure. The TTL exposure meter supports a evaluative, center-weighted, and spot meter modes. It has a range of 2 to 21 EV with f/2.8 lens. Film sensitivity can be set from 6 to 6,400 ISO. The supported exposure modes include P, aperture-priority, shutter-priority and a metered manual exposure mode. Changing modes is simple. To use P mode set the shutter dial and aperture ring to A, set shutter dial to A and desired aperture for aperture-priority, set aperture dial to A and select desired shutter speed for shutter-priority. Exposure compensation can be in -3 to 3 EV in 1/3 steps with a dedicated dial. Below this dial is a lever that can set auto bracketing. It can be set in 1/3, 2/3 and 1 EV steps. Using it will fire three exposures. Setting this to ISO and using the up and down arrows to change film speed. A small ML button is provided to lock a meter reading. The finder uses interchangeable focusing screens. Screen options include grid, microprism or split-image screens. The finder screen shows data such as shutter speed, aperture value, focus indicator, flash status, exposure comp, and a exposure bar. The eyepiece features a diopter that can be adjusted -3.5 to +1D. The LCD on the top shoulder has indicators for data imprinting, battery, ISO, and the exposure counter. When loaded with film the exposure counter is always displayed even when the camera is off. It is powered by 6x AA batteries loaded into a holder and inserted to the base of the right hand grip area. The battery last approx 130 rolls of 120, or 100 rolls of 220 film. 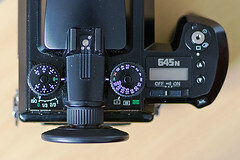 The Pentax 645NII released in 2001, is a revision that supports mirror lockup. The NII version of the camera has more custom function settings that can change a variety of camera operations. The data imprinting feature has expanded with more data. It now includes auto bracketing, AE lock, flash, focus mode, AF mode, AF area, and ISO speed. Setting the film ISO is now on the exposure comp dial instead of on the separate surrounding bracketing ring. F1: shutter speed step, single or half. F4: self timer delay 2 or 12 sec. F8: film count and frame count display in finder. F9: exposure per film. 120 film 15 or 16; 220 film 32 or 33. ↑ 1.0 1.1 Shashin Kōgyō (Photographic Industries) Vol. 56, No. 3 (1998) pp 58-66. This page was last edited on 3 December 2017, at 12:56.